If you'd like to read a real review which actually contains my feelings about this series, how about you Check out my review for book 1 by clicking this link.I finished book 3 and am at a bit of a loss about what to say at this point. 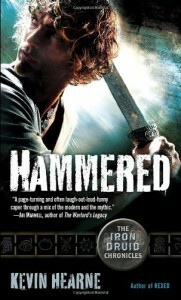 Kevin Hearne books are fun and full of action. Each book has its own story, so it probably shouldn't be too hard to come up with a new review for each installment, but I find myself wanting to gush about all of the things which are consistently the same with each book, so that's why I redirected you back to my review for book 1. If you're interested in possibly checking out the series, that would be the best point of reference.For the people who are already fans of the series, they'll probably understand better why I was at a loss for words. I rarely do reviews in pictures but consider this my summary because I have nothing else to say :IT'S THE (semi) EPIC BATTLE OF*edit* pictures removed because my photobucket account broke and I'm too lazy to move pics from every review over to imgur.Just take my word that there were pics of Atticus, Thor, a very buff squirrel, a stop sign, and a salad spinner.DON'T YOU WISH PHOTOBUCKET HADN'T BROKEN MY STUFF?...and here's a quote I liked. "One cannot solve every problem through sheer machismo and violence. ""Why not? It works for Chuck Norris. "So that about sums it up. It's another awesome Kevin Hearne book. I missed Oberon's presence being in full force but otherwise the read was solid, if a bit confusing at first because it had been a while since I'd read book 2.Is anyone else wanting Atticus and Granuaile to quit beating around the bush?